Designed to keep horse’s legs warm, dry and protected in the stable, Equi-Chaps Stable Chaps from Equilibrium Products have become an essential part of the stable management routine for many. These soft but durable Stable Chaps completely encase the lower leg to help protect from scuffs and grazes, extending over the coronet band and bulbs of the heel to help protect these vulnerable areas. Lined with superb wicking material, Equi-Chaps Stable Chaps are ideal for wet, cold legs after exercise or turnout. 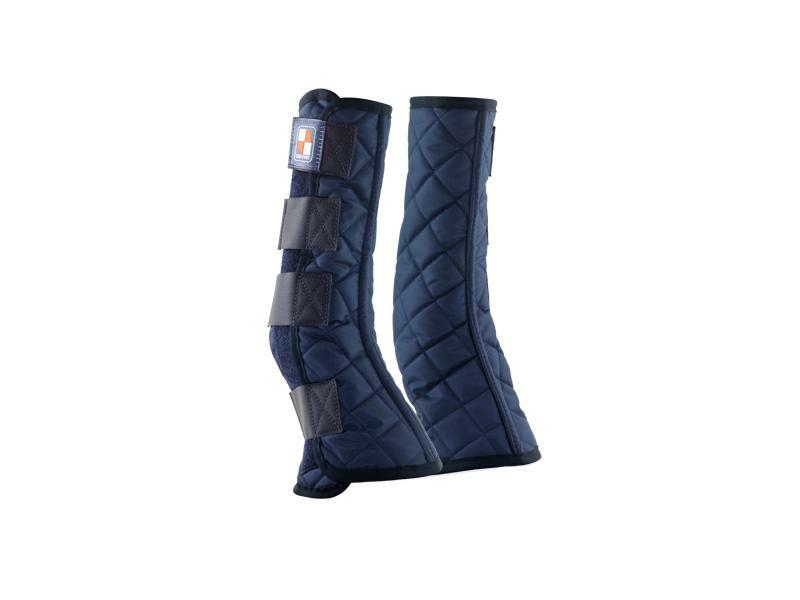 By helping to keep joints warm and maintain effective circulation these Stable Chaps can help to reduce legs filling and relieve the symptoms of arthritis in afflicted horses. Fast and simple to fit and remove, Equi-Chaps Stable Chaps have a ‘Pressure Jet’ PU outer coating that repels shavings, straw, dust and dirt; is easy to clean and wash; and offers all the benefits of stable bandages but without the hassle. Equi-chaps® Stable Chaps can be worn all day and / or all night, with regular checks for comfort and cleanliness. They should only be used in the stable and are not suitable for turnout. Can I put the Chaps on wet, muddy legs? Yes, but it is best to wash or brush the mud off first, this will be more comfortable for the horse and keep the Chaps cleaner for longer. Can I put the Chaps on wet legs? Yes, gently pat legs dry with a soft towel, then put the Chaps on, they will wick away any remaining moisture. Can I use the Stable Chaps if my horse has mud fever? Yes, as long as the condition has been treated first. Equi-chaps® Stable Chaps are machine washable at 40°C, using a mild detergent. Close over hook and loop straps to prevent the collection of debris. Ensure they are fully dry before they are put back on the horse. Below are some recent questions we've received regarding Equi-Chaps Stable Chaps, including answers from our team. Are these boots for front and hind legs? These are suitable for wear both on the front and hind legs, though some horses may require a size up for the hind legs if they are much larger than the front.